Chapter after chapter of Cover of Snow shocked and impressed me. 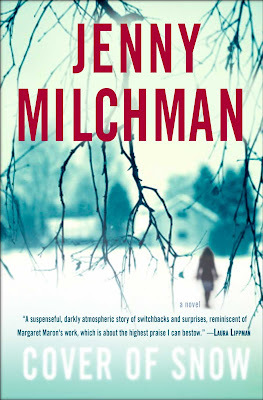 Jenny Milchman's literary mystery captured me with this urge to stick with Nora until the truth came to light, until the reasons why her husband decided to end his life were found and understood. The story mostly takes place in Wedeskyull, New York, a small town with huge, dark secrets that affect just about everyone in it. Nora wakes up to find that her husband has committed suicide, but the questions don't start rolling in until Nora's sister Teggie prompts her with startling observations. Teggie's character was a foil to Nora whose presence in the plot helped shape the way reader's view Nora. Where Teggie wasn't afraid to face facts about her brother-in-law's strange ending, Nora didn't want to believe that anything could've been wrong in their life for her husband to kill himself. When Nora didn't think asking questions would pull her out of grief, Teggie pushed her to find the answers she needed for closure. Nora may have needed the extra few pushes to dig into her husband's closeted past, but I had to admire her for her courage to continue investigating, even when dangers began to surround her. Cover of Snow is portrayed through Nora's first person perspective, but every so few chapters Milchman introduces the third person perspective of another character. Those interludes are what scared me the most as they provided fragments to the bigger picture, showing the lengths some would go to keep a secret hidden. Milchman puts everything out on the table for readers over the course of the story, but it's as if the answers are hiding in plain sight. I couldn't put the story together until the last few chapters, and even then I was in disbelief. Someone, or possibly some ones, in Wedeskyull doesn't want Nora to find answers. I think this was the biggest draw in the story's mystery. Wedeskyull is the kind of town where residents pride themselves on being from a family who's resided there for many generations. They don't take kindly to tourists or newcomers. That mentality coupled with a 25 year old tragedy is what led Nora into a growing web of deceit, secrets and violence that Milchman expertly weaves. I loved the innovative way Milchman tells Nora's story, because it is definitely the kind of story that every reader will get a different vibe from. To me it was tragic and dark with an undercurrent of hope. I had never considered mystery to be a genre that could bring forth as much raw emotion as Milchman's Cover of Snow. There were so many times that Nora's grief, stress and even her determination brought tears to my eyes, but what really pushed me over the edge was the conclusion. At first it seemed like it was heading on a too simple path. However, just one scene made me rethink, not only my initial evaluation of the ending, but all of Cover of Snow. 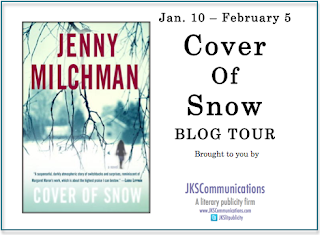 If Cover of Snow was a play and I were the audience, I would give Jenny Milchman a standing ovation! Thank you very much for reading my debut novel, and sharing such encouraging thoughts. They are truly appreciated.